and a highly successful fundraiser with a passion for harnessing and focusing the power of philanthropy. Over the past two decades, Sean Malone has earned a reputation as an entrepreneurial, mission-driven nonprofit leader. With a diverse background, Sean brings an integrative approach to his work and is passionately committed to the impact he can help an organization achieve. His mission-fit focus leads to fiscal and institutional health, vibrant programs that serve, and the accomplishment of ambitious goals. Sean grew up in Evanston, Illinois, the son of a high school special education teacher and university music professor. From the age of ten, Sean spent every summer at Harand Theatre Camp in Wisconsin, and his first job was as a counselor and music teacher at that camp – experiences that he feels shaped his core values and cemented his love of the arts. Sean was active in theatre and music throughout high school, and was awarded a scholarship to attend the competitive BFA conservatory program in acting at the University of Southern California. While at USC, he had accidental forays into nonprofit management, but his primary focus was on his conservatory training. After graduation, Sean experienced success as a professional actor, singer, and director – but, to his surprise, found himself missing the broader-picture arts management work he’d done while at USC. In addition to other nonprofit projects, he spent nearly two years in senior management roles at the world’s largest tele-fundraising organization, running campaigns for organizations including Mother’s Against Drunk Driving and the National Association for the Prevention of Child Abuse. While doing this work, Sean realized that his true passion was to lead nonprofit organizations to have a profound and positive impact on people’s lives, moving him to pursue a Masters in Business from the University of Wisconsin-Madison, with a specialty in Arts Administration. At the conclusion of this rigorous program, Sean was named 1998 Outstanding Graduate Business Student – the first time in the school’s history that this designation was awarded to a student in the Arts Administration program. While completing his Masters work, Sean was approached by Dr. Joseph W. Garton (1946-2003) to develop strategic and fundraising plans for Ten Chimneys, the imperiled Wisconsin estate of Broadway legends Alfred Lunt and Lynn Fontanne that Dr. Garton had just purchased to save from immediate destruction. Dr. Garton became a deeply important and influential mentor to Sean as they worked together to define the mission of the organization and then build the programs, infrastructure, and community support needed to realize that mission. In 1998, Sean became Ten Chimneys Foundation’s first Vice President, serving as the organization’s Chief Operations, Development, and Financial Officer. In 2002, before completion of the capital campaign to restore Ten Chimneys and open it to the public, Dr. Garton was diagnosed with an aggressive cancer and took an immediate and full leave of absence – and Sean was asked to step into the President’s role. Dr. Garton lived to see the success of the campaign and the opening of Ten Chimneys the following year before passing away. During Sean’s tenure, Ten Chimneys Foundation grew from a two-person startup to a multi-faceted organization, a world-class historic site, and a national resource for theatre and the arts. Following a successful 8-figure capital campaign that many experts and community leaders considered unachievable, Sean and the Ten Chimneys team built a focused, disciplined, and financially strong organization, sustainably quintupling annual giving levels and achieving great programmatic, financial, and organizational success. With its values-driven tours, Ten Chimneys garnered a reputation as one of the most inspirational and innovative historic sites in the United States; its unique public programs and performances offered special experiences not otherwise available to the community; its museum store was nationally recognized as a model of mission fit and retail success; and its traveling exhibitions were installed on Broadway, in Chicago, and at The National Theatre in London. The organization’s success, stability, and prudent planning and financial management allowed for new ambitious goals and calculated risk-taking – and Sean conceived of and launched the Lunt-Fontanne Fellowship Program, a program to serve America's most accomplished and revered stage actors, culminating in an annual 8-day master class and immersion experience at Ten Chimneys — an otherwise-nonexistent opportunity for the mentors to be mentored. This national program was hailed as "groundbreaking," "powerful," "deeply needed and meaningful," and "transforming American theatre." To ensure the maximum impact of the program, Sean built close collaborative partnership with the top regional theatres in the country (e.g. ACT, Arena Stage, Goodman, Guthrie, Old Globe, OSF, Seattle Rep, South Coast Rep, Steppenwolf, Woolly Mammoth, and more) and secured the participation of, and collaborated closely with, Master Teachers including Lynn Redgrave, Barry Edelstein, Olympia Dukakis, and Joel Grey. Photo from the Arizona Republic. Click here to read their article "5 Milestones of Wright CEO Sean Malone." After fifteen years at Ten Chimneys Foundation, Sean took on the post of President and CEO of the Frank Lloyd Wright Foundation and School of Architecture – a national nonprofit that exists to preserve the National Historic Landmarks Taliesin, in Wisconsin, and Taliesin West, in Arizona, and enrich society through an understanding of Frank Lloyd Wright's ideas, architecture, and design. In addition to preservation work, the Foundation runs a fully accredited School of Architecture, owns and stewards the intellectual property for all of Wright's designs and creations, serves public Wright sites around the country, offers K-12 educational programs, and manages tour operations of 100,000+ visitors a year in Arizona. Sean originally signed on for a two-year term, but ultimately agreed to double his tenure to help the organization make the biggest possible strides forward during an important and exciting transitional period for the institution. During his four years in the post, he led the Frank Lloyd Wright Foundation to build the internal capacity (focus, discipline, infrastructure, planning, and measurement for the staff and multiple boards) to sustain programmatic-impact and revenue growth for decades to come. 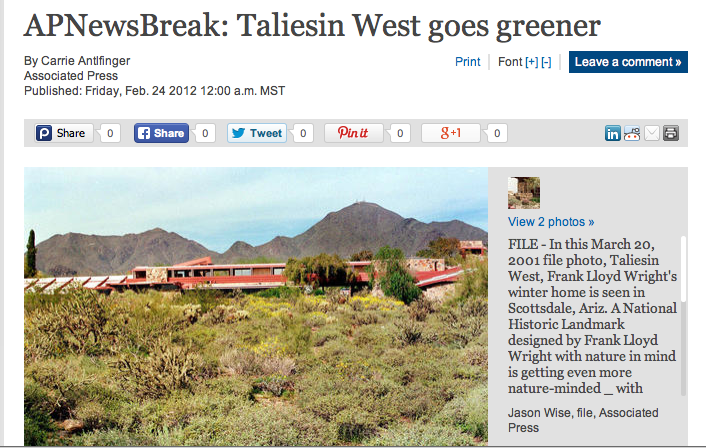 At the same that that the organization set the stage for its long-term success, Sean and his staff and trustee colleagues also realized a number of critical accomplishments, including the groundbreaking joint stewardship of the $500 million Frank Lloyd Wright Foundation Archives with the Museum of Modern Art and Columbia University, a comprehensive Preservation Master Plan to define how Wright's Taliesin West will be preserved for future generations, a pioneering initiative to convert the 500-acre national landmark into a net-zero energy site, an impact-focused overhaul of public tours, the doubling of the philanthropic investment in the Frank Lloyd Wright School of Architecture, the tripling of the philanthropic investment in preservation of the two Taliesins, and more than quadrupling the Foundation’s annual contributed income. Sean was honored to be selected as one of “the 100 top arts and cultural leaders in America and abroad” invited to participate in the inaugural, multi-year Chief Executive Program through National Arts Strategies. He has received post-professional certificates from intensive executive education program at the Schools of Business at: University of Michigan (2011), University of Texas–Austin (2012), and Harvard University (2013). In 2016, after his tenure leading the Frank Lloyd Wright Foundation and a planned “service sabbatical” that followed (intensive and immersive pro bono work in the areas of arts/culture, social services, healthcare, and education), Sean dedicated his passion, experience, and efforts to high-level strategic consulting with board and staff leaders of impact-focused nonprofit (for-purpose) organizations. He has consulted for projects/organizations with budgets as low as $200,000 and as high as $80 million, helping organizations embrace the focus, framework, discipline, and capacity-building that is fundamental to mission-driven success. Sean currently lives just outside Milwaukee with his two daughters, Emma Rose and Lili Louise (named for Lynn “Lillie Louise” Fontanne of Ten Chimneys) and his wife, Erika Kent – an accomplished fundraiser and nonprofit wonk, and Sean’s valued colleague and collaborator. Aside from his work, Sean enjoys spending too many hours baking bread, listening to podcasts, and pretending that, one day soon, he’ll run his second marathon.